Climate change protesters today disrupted First Ministers Questions at Holyrood as Nicola Sturgeon clashed with other party leaders. A group of five campaigners from the Extinction Rebellion organisation draped a green banner from the public gallery, calling for zero carbon emissions, as Tory Deputy leader jackson Carlaw quizzed Ms Sturgeon at the start of the session. 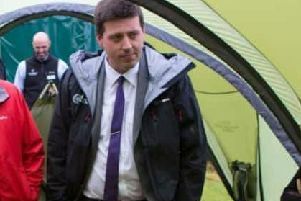 The group were then led away voluntarily by security staff as Presiding Officer Ken Macintosh suspended proceedings. A spokesperson from from the campaign said afterwards: "Extinction Rebellion Scotland did not wish to undermine other concerns raised by MSPs, but to highlight the climate crisis as this is not sufficiently dealt with despite its pressing importance." The group recently staged a "sit-in" at Holyroood and has organised climate protests across Scotland. Mr Carlaw said afterwards: "If we're not to be a fortress, Presiding Officer, we have to be prepared to accept the demonstrations and the democratic right they have to that."